I was the first person to workout at the PACC 29 years ago. I have been a member ever since! What has the PACC done for you? Exercise is a big part but the people are my main reason for coming every day! I enjoy being around people who are working to improve and better themselves. What is your favorite activity at the PACC? I ran 10 miles for 18 years before I came to Perham. I used to do 6,000 steps on the elliptical and then moved to the treadmill when it was bothering my achilles tendon. Now I use the recumbent bikes because it feels good on my achilles and John has fixed those bikes more than once for me so I thank him for that! 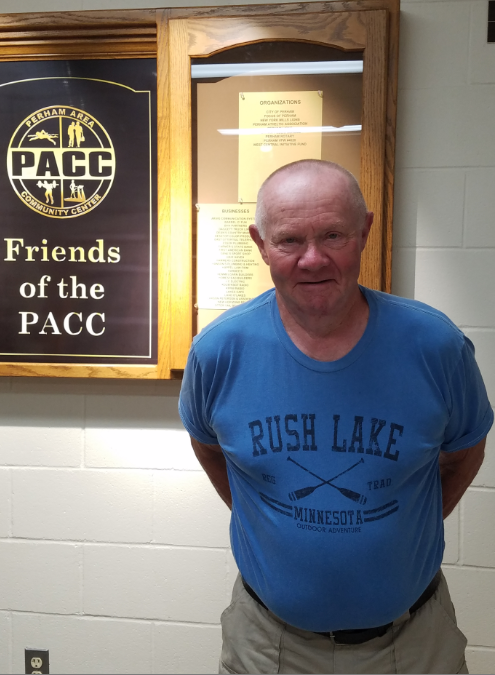 What is your favorite memory of the PACC? My greatest memories are meeting all the high school students. There are some hard working kids. I remember comparing height with a student every fall and spring when I would see him. The people and connections I have made are by far some of my favorite memories and the reason I come to the PACC each day!